The implantology deals with the replacement of missing teeth with implants that support artificial teeth. When you put pure titanium implants into the bone, the bone grows in direct contact with the implant surface. This phenomenon is called osseointegration and enables the implants to become an integral part of the body, as are the roots of natural teeth. The implantology is out of the “pioneering phase” and has become an official field of dentstry at the beginning of the 80s in the United States and around the 1985 to 1986 in Italy. The implantology deals with the replacement of missing teeth with implants that support artificial teeth. When you put pure titanium implants into the bone, the bone grows in direct contact with the implant surface. This phenomenon is called osseointegration and enables the implants to become an integral part of the body, as are the roots of natural teeth. When and how the implantology was born? The implantology is out of the “pioneering phase” and has become an official field of dentstry at the beginning of the 80s in the United States and around the 1985 to 1986 in Italy. The “formalization” occurred only when the prestigious Swedish School of Prof. PI Branemark introduced the world to the international scientific clinical research who demonstrated irrefutably that the implant positioning is a treatment with a very high success rate, more than 95% after 10 years. Our clinical experience dating back to 1986 confirms these data. The implant is currently taught in all the most prestigious Italian and foreign universities. In the past years, were born professional academies that organized conferences and courses to spread the “modern implantology” at national and international level. Dental implants are artificial roots made ​​of titanium that are placed into the jawbone to replace the roots of missing teeth. Are dental implants medical devices? Must be certified? Of course, because as of 13 June 1998, the Italian legislation prohibits selling medical devicesand evendental implants that do not comply with the quality standards established by the European Community for the protection of patients and surgeons. What benefits are with prosthesis on implants? the maintenance of the alveolar bone in correspondence of the elements replaced by implants, which would otherwise undergo resorption. The implant, stimulates and protects the bone as the root of a natural tooth. greater confidence in speaking and smiling. The advantages will allow you to improve the quality of life, appearance, and in a broad sense your overall health. How can you contribute to the success of the implant? It is in the interest of the patient to carefully follow the table of references set by the clinician and provide reports of any changes in overall health status. With an average commitment of 3-4 annual inspections, and maintaining a constant and proper hygiene at home, the prosthetic implants are preserved for a long time. Which patients are candidates for implant dentistry? In this category may be included: young people who have completed their growth phase, usually 16 years for females and 18 years for males, who lack (have not erupted because there is no germ tooth) some permanent teeth. Patients that, after a trauma, have lost some teeth, as part of a healthy dentition. Patients who have performed in the past extensive oral rehabilitation with fixed bridges that need rebuilding, whose pillars (on which rests the teeth prosthesis) do not give guarantees of lasting. Patients with removable partial prosthesis (denture) or total (complete dentures) which for functional, aesthetic or psychological reasons,are in need of a fixed prosthesis. There are no age limits, however, for each clinical case must be assessed the real psycho-physical condition. It is always possible have recourse to implantology? Each individual patient must be examined carefully, as must exist some specific conditions that allow using this type of treatment. A basic condition is that the patient is not suffering from periodontal disease in active phase (commonly known as “pyorrhea”). A careful diagnosis and proper periodontal therapy allows to perform implantology also in this kind of patient. Another important factor to consider is the smoke. Clinical research showing that smoking has a negative effect on periodontal and implant have been recently published. Patients who smoke more than 10 cigarettes per day should be viewed with great caution. Another important condition is that the patient is not suffering from pharmacologically uncontrolled systemic diseases (diseases that involve the whole body such as diabetes, blood disorders, etc.). These diseases can be diagnosed through a careful medical history prior to surgery (patient history), blood and instrumental tests (x-rays, etc.). Finally, it is considered appropriate to perform implantology only on the patient who can maintain a thorough oral hygiene at home and look at the periodic checks established. We will provide you with the latest oral hygiene instructions and a useful brochure. Intervento di implantologia: cosa un paziente deve sapere. In case of lack of bone, it is still possible to perform implant surgery? Yes, thanks to the use of membranes and bone grafting autologous (patient’s own) or other biocompatible materials. For example in the upper jaw the presence of the maxillary sinus, a cavity located above the molar region, can in some cases prevent the placement of implants. it is possible to partially fill the cavity with a bone graft and then proceed with the placement of the implants. In some cases, implants are placed contextually Invasive ricostruzioni ossee per poter mettere i denti. Sono sempre necessarie? What happens during the surgery? You need hospitalization? No. In most cases, the surgery can be performed under local anesthesia. The patient is practiced mild sedation to reduce the level of anxiety and increase his state of comfort. The operations room is adequately prepared to perform an oral surgery.We use special equipment that allow us to check the comfort level of the patient throughout the procedure. In more complex cases it is advisable to operate in a more specialized facility, in the operating room with the help of the anesthesiologist. In case of admission to hospital is usually required to stay overnight. In some cases the patient can be discharged the day of surgery (interventions in Day-Hospital). No. If the surgery is outpatient, we operate under local anesthesia using anesthetic specially developed for oral surgery. These anesthetics are very effective and produce a deep anesthesia. The patient does not feel any pain. After the surgical procedure will be prescribed analgesic-anti-inflammatory drugs which can effectively control the possible occurrence of post-operative pain. As you proceed in detail? The transition from surgery to the inclusion of the prosthesis is articulated in two or three steps, depending on the clinical case: stage 1 – titanium implants are inserted into the bone through a surgical intervention; followed by a waiting time variable that can range from 2 to 9 months to allow the system osseointegration; Phase 2 – at the end of the period of osseointegration, with a small operation done under local anesthesia, a healing abutment is applied to the end of the implant , which rises to the surface of the gum; Phase 3 – which tooks place after the healing of the gums around the abutment, we proceed to execute the prosthesis (ie, artificial tooth) and its fixation to the implant. 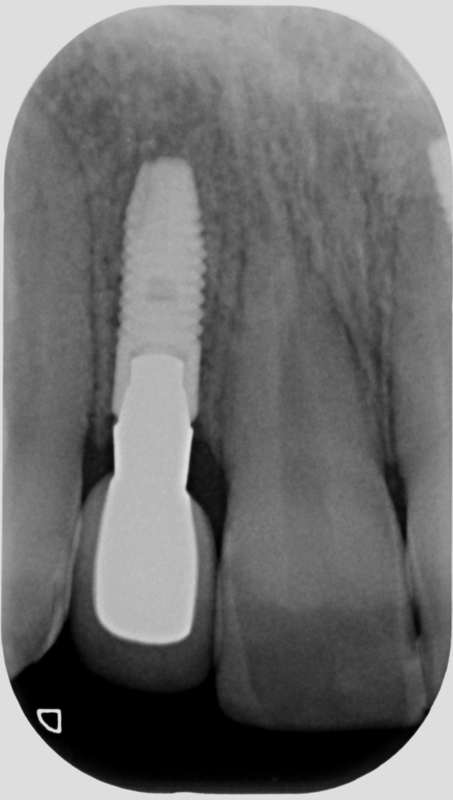 In some clinical cases, the first step is the placement of the implant and the abutment connection of healing in a single operative time, so after osseointegration we proceed directly to the prosthetic phase. The surgeon will explain after the diagnostic phase what type of operation (one / two step) will be most suitable for your oral situation. In some selected cases it is possible to place the temporary fixed prosthesis in the same session or the final few days after the surgical procedure. This method is called “immediate loading”. Il carico immediato, denti fissi subito. Mito o realtà? How many implants are needed? The number of implants depends on the number of missing teeth; with the exception of total restorations (patient with no tooth on a jaw), normally we place an implant for each missing tooth, sometimes two implants per tooth (for example in the case of the molars, which have two roots). When placing two or more implants, one beside the other, the crowns are usually welded between them, to better withstand the forces of mastication. How is possible to reduce anxiety that comes for surgery? What are the risks or complications of surgery? The risks and complications, from the general point of view, are comparable to a common dental surgical treatment if the patient is in good health. If, during the diagnostic phase clinical data that need to be explained emerges, we will require the cooperation of other specialists. The local risks and complications are minimal by making an accurate diagnosis and using radiographic images such as CT (Computed Tomography). However, working in proximity to nerve endings, can sometimes persist for a few weeks, at most a few months, a slight feeling of tingling. This occurrence is rare and in some cases may be permanent. However, it occurs more frequently when operating at the level of the jaw and is inherent in the surgical technique. In elderly patients is more frequently the formation of hematomas. The swelling should not cause concern: such eventuality can not be considered a complication but a factor of normal post-operative course. Drug therapy with anti-inflammatory limit the swelling. For each operated area will be provided with all the information about the possible risks and specific complications. What are the risks or late complications of prostheses supported by osseointegrated implants? The complications of prostheses supported by osseointegrated implants are rare. However, you may encounter some problems in the years of inflammatory or mechanical nature: in case of inadequate implementation of the necessary home oral hygiene maneuvers or failure of periodic checks established, the implants, like natural teeth, are likely to experience the phenomena of inflammation caused by bacterial plaque and tartar. Bacterial infections untreated can progress to loss of the implant. At the slightest discomfort or pain, the patient should immediately request a check. Initial cases of periimplantitis are easy to care! The definitive dental prosthesis are generally fixed to the implants by screws or special cements. With the function and prolonged wear, fixation screws can come loose or fracture of the prosthesis can happen. The cement with time may lose its containment function. In this case, the prosthesis begins to have some mobility, and even in the absence of pain or discomfort in the prosthesis must be screwed or fixed immediately to avoid damage to equipment and broken fixation screws. Even in this case is very important, therefore, that the patient requires an immediate check-up at the clinic. There is the possibility of rejection? No, because titanium is a material absolutely biocompatible, since completely inert from the biological point of view. There is, instead, the possibility of “implant failure”, which can occur immediately or in the medium-long term. The immediate failure (failure to implant osseointegration before the prosthetic phase) is extremely rare (from our experience and from data published in the literature immediate failures represent 2% – 3% of cases). In the case of rehabilitations or more teeth fixed prosthesis on implants, in the programming stage-surgical implant, the design provides a number of implants which allows to have a “safety margin” to count on in case of failure. The failure in the medium to long term may instead be caused by improper maintenance of the system. It is important that the patient should undergo periodic inspections and to heed carefully his own oral hygiene. During the periodontal and implant maintenance phase, which consists of 3-4 calls over the year, the patient in addition to the normal procedures of professional hygiene will be subjected to a meticulous clinical monitoring of the systems and once a year for a X-ray check. What happens in the mouth when a system fails? The residual biological damage in the event of an implant failure with modern implants is non-existent. The loss of the system is comparable to the extraction of a tooth (eg. Incisor), and does not affect the ability to place another implant immediately or after healing has occurred (after 2-3 months). There are ways to check osseointegration? Yes, there is a non-invasive painless survey instrument; connecting a transducer to the implant we can read the level of osseintegration. This information lets us know when is possible to load the implant in the bone. Is it possible to intervene again at the level of prostheses on implants? Yes, all the prostheses on implants are attached to the implants themselves using screws or special cements and can be removed from the prosthetist if it is felt necessary. The patient can not remove them, and to all intents and purposes look and function like natural teeth. How often the artificial teeth related to implants need a makeover? The prosthetic implants have a lifespan comparable to the prostheses on natural teeth. After a certain period of use, the prosthesis need to be redone. This depends on the type of material with which the prosthesis is constructed and the clinical condition of each individual patient. The prosthetist may provide a “personalized expectancy” of your prosthesis that we can estimate an average of around 10 years. What are the alternatives to restore missing teeth or to stabilize removable dentures? No treatment. However, in some cases the loss of even a single dental element may cause aesthetic and functional problems resulting imbalance at the level of the masticatory apparatus. Dentures. In many cases, especially at the level of the jaw, the stability of the dentures is insufficient because of atrophic edentulous alveolar ridge (the bone where the teeth are missing). Also, The dentures by transmitting the masticatory load directly on edentulous ridges cause a slow and progressive bone resorption. This resorption may, in the long term, making it more difficult to treat by osseointegrated implants. Removable partial dentures anchored to the remaining teeth (dentures). The skeletonized inevitably transmit an additional load to the remaining natural teeth which are anchored. Also, like dentures, directly transmit the masticatory saddles edentulous (areas where teeth are missing) accelerating atrophy. Fixed bridges. In case of loss of a single element with neighboring teeth healthy, the treatment with a plant, which supports the missing tooth instead of the traditional three-unit bridge, allows to avoid the preparation of the two prosthetic dental elements neighboring healthy. Why the implants are expensive?